For needs big and small, Nancrede Engineering offers the most comprehensive line of chloride-anion dealkalizers. All dealkalizers employ valve control centers. Patented engineering innovations provide greater efficiency such as higher capacity, higher flow rates with lower pressure drop, and lower operating costs. Units are designed for fully automatic operation. The frequency of regeneration may be determined by time, volume throughput, or effluent water quality. A packaged chemical metering pump assembly is used to feed a small amount of caustic during regeneration to insure optimum capacity for alkalinity and carbon dioxide removal. These commercial/industrial dealkalizers are complete, pre-engineered units and require simple field utility hook-ups for economical installation and startup. 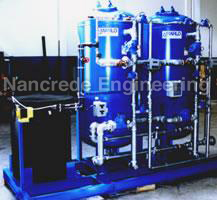 Nancrede Engineering’s chloride cycle anion exchangers are unique in that they permit alkalinity reduction without the use of acids. Alkalinity reduction is important in treating water for boiler make-up, since alkalinity is frequently the limiting factor in dictating the amount of boiler blowdown. Dealkalization can significantly lower operating costs while allowing production of cleaner steam because blowdown wastes expensive fuel and chemical boiler treatment. Since natural alkalinity breaks down at boiler temperatures to form CO2, the reduction of alkalinity will reduce line corrosion and reduces the amount of return line chemical treatment. Free CO2 in the water is also removed, to produce excellent boiler make-up water, by adding a small amount of caustic to the salt brine regenerant. Dealkalizers are best suited for dealkalizing softened water for boiler make-up. Higher boiler operating pressures dictate lower tolerance for alkalinity and more dependence on dealkalization. By increasing the amount of regenerant caustic and raising the regenerant water temperature to 90°F, the dealkalizer can also function to reduce silica from boiler make-up water. Silica reduction is especially important in high pressure boilers producing steam to drive turbines. Dealkalizing unsoftened water (no caustic in regenerant) for make-up to cooling towers can greatly simplify the entire chemical treatment program; it will allow for less blowdown while still maintaining a scale-free system. It is important to remove sulfates or nitrates for some manufacturing processes such as irrigation or animal ingestion. Since these are both anions, they can easily be exchanged for chloride in a chloride anion exchanger dealkalizer. Chloride cycle dealkalizers utilize the a valve control system with downflow regeneration of a strong base anion resin. It regenerates with salt brine (NaCl) plus a small amount of caustic (NaOH) blended one part caustic to 10 parts brine. The caustic increases the capacity and removes all carbon dioxide from the make-up water to produce a neutralized effluent. In some cases (cooling tower make-up, for example) a dealkalizer is operated without caustic, and the carbon dioxide is not removed, effluent is slightly acidic, and capacity is reduced about one-third. A dealkalizer operated with caustic will remove alkalinity approximately 90%. All water entering the dealkalizer must be softened to remove calcium and magnesium that would produce fouling deposits in the dealkalizer resin. For this reason, salt used for regeneration must be free of hardness. The dealkalizer will remove bicarbonate (HCO3-), carbonate (CO3=), sulphate (SO4=), nitrate (NO3-), and carbon dioxide (CO2). All must be considered as TEA (Total Exchangeable Anions) when applying a dealkalizer. A dealkalizer regenerates with 4 to 6 lbs. of salt and 0.4 to 0.5 lbs. of caustic per cubic foot of resin. The TDS (Total Dissolved Solids) content of the water will not be altered, while a light silica reduction is common. Additional silica can be removed by regenerating the dealkalizer at higher caustic dosages and warming the regeneration water to approximately 95°F.